Digital Guitar Tuner is a free Windows software, which let's you accurately tune your guitar using direct input or microphone. Version 2.3, featuring 27 tuning types, is available for downloading. 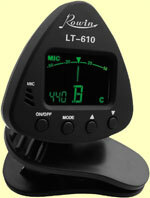 If you also need an off-the-computer guitar tuner, please check our Rowin LT-610 clip-on guitar tuner. You can download the full version from this site by clicking the DOWNLOAD button.